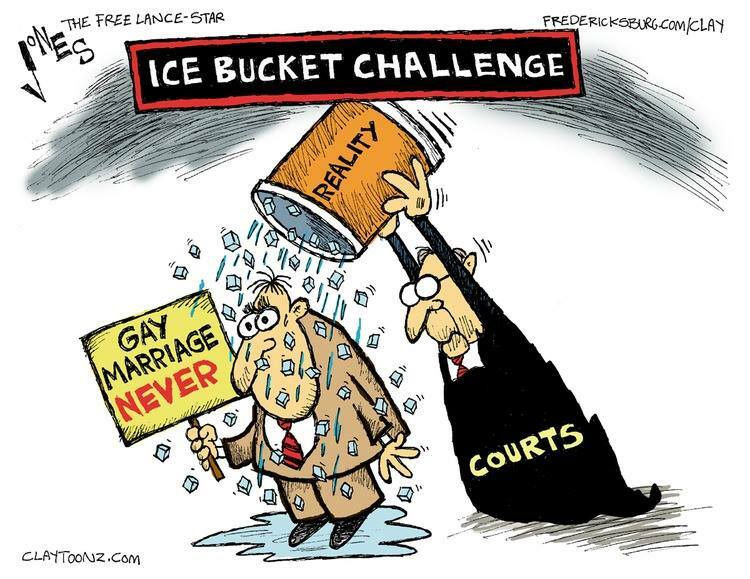 Isn’t it too bad we don’t have an ice bucket being tossed over all these adulterers who claim to be such ‘Family Values’ politicians and Evangelinuts? Adultery is going to happen – because we are all human. BUT do not expect me to give you a free pass simply because you’re such a morally superior person and you hide behind your Jesus union card as ‘just a flawed human being’ – when you are not willing to give a free pass to that guy ‘over there’ that does not look like you, worship like you or have the same political beliefs. Yep, it seems we will get marriage equality figured out! Hooray! Any step towards equality is a good one in my book. I am not naive enough to think the haters will think differently or behave kindly, but I still support the law of our land being on the equality side, not the haters side. More success! Many Americans are benefiting from having affordable insurance available and even more from the regulations which make the insurance much better and more reliable! Poor republicans. They offered no ideas, no solutions to what does need to be improved, they wasted all our tax money on their many failed attempts to repeal what helps Americans! How in the world will they ever be thought of as anything more than the party that looks after the mega wealthy while sticking it to the middle class!? (from the link): For Republicans, the Obamacare reckoning has arrived sooner than expected. But the train never wrecked. The law rebounded, surpassing its signups goal and withstanding a flurry of attacks. The issue seems to have mostly lost its power as a weapon against Democrats, and a growing number of Republican governors — even in conservative states — are warming to a core component of Obamacare, the Medicaid expansion. To get a sense of why this is worrying for Republicans in the long run, look no further than conservative strategist Bill Kristol’s 1993 memo — “Defeating President Clinton’s Health Care Proposal” — warning that reform would paint Democrats as “the generous protector of middle-class interests” and strike a “punishing blow” to the GOP’s anti-government ideology. “But the long-term political effects of a successful Clinton health care bill will be even worse — much worse. It will relegitimize middle-class dependence for ‘security’ on government spending and regulation. It will revive the reputation of the party that spends and regulates, the Democrats, as the generous protector of middle-class interests. And it will at the same time strike a punishing blow against Republican claims to defend the middle class by restraining government,” Kristol wrote. In other words, the real fear back then was that health care reform would succeed. I will never understand how Republicans – being cheered by these self-professed Evangelinuts – are so desperate to keep their fellow Americans from having the access to health insurance. We are not even talking about paying for actual health care – we are talking about paying for health insurance. These are two different things. One can pay for health insurance and never make one claim – that is totally possible. Is it a smart thing to do? No…. but there are folks who do not take routine medications and they do not go to the doctor unless they are sick. But putting all that aside – why wouldn’t we want all Americans to be able to access the health care so everyone can be in the best of health? I don’t understand the GOP thinking …. BTW – Without Obamacare, Medicare and Medicaid – a lot of these health care providers and hospitals would go bankrupt. Like I’ve said before – there is an underlying motivation as to why the Catholics have bought up the majority of these hospitals and doctors’ offices – and that is because they are money makers. Via Christi has a slogan – because your life matters. Now that Congress has returned to Washington, there are a lot of people counting on Speaker Boehner to buckle down and get to work, and stop letting extreme voices in the House stand in the way. It’s not like anyone expects Speaker Boehner to be as effective and productive as Speaker Pelosi was, but we all know he can do a better job! LOL I checked my e-mails earlier and got one from someone responding to something that was on Facebook. It was in reference to one of my responds to an article on Facebook. The reply was a simply question, “Are you really a Republican or are you just stupid?” I told them yes I am a Republican and do tend to be more the fiscal conservative then the social. But I am not stupid enough to buy into it when it is oblivious that they are peeing on my leg and shouting “Look it is raining!”. IN general if a discussion forms I can win them over to me. It is amazing how many Republicans are agreeing with me an say that they have been feeling the same way. LOL I will keep working on getting people straightened out! I know that Ron Paul is not too popular around here, but his article kind of explains why I like him and voted for him twice. His son Rand doesn’t seem to be as sure where he stands as Ron always did. Rand will change his opinion from day to day — which is fine and dandy if the change of mind is admitted and explained. Rand denies changing positions even tho there is recorded evidence of what he said previously. That’s something I can’t admire or respect. I agree 100% with Ron Paul about how our military should not be used as the global policeman. (from the link): America must not be conned into another war or irresponsible military action. Ask yourself a question. How can ten thousand or so men in pickup trucks with guns welded on its flatbed with a few captured American tanks be a threat to the world order? How would they function to sustain those they oppress without an eventual internal revolt? A contained ISIS can raise havoc in its immediate vicinity but will die like how any epidemic burns itself out. It will take longer if those in the vicinity capable of resisting the threat do not immediately resist. The military industrial complex and its puppets in the media and Congress play into the game. After-all, it is a gain for them both. For the military industrial complex they profit from the bombs, military hardware, and services they provide. Congress keeps Americans in a state of fear. Americans remain paralyzed and take their eyes off the ball. They are no longer focused on a plutocracy extracting their wealth and squandering their economic future. Will we be conned into war again? ISIS / ISIL the pretext? I think Obama will eventually give in to the NeoCons and military industry complex and let them have a new war…..
Damn…I am so disheartened by that possibility..
well I decided to do a little experiment. the school bus driver and his aid daily after all the kids are off the bus. Talk to me about politics, mainly the President. They are sure he is really a Moslem and hell bend on destroying the United States. I told them today I have heard that the Tea party Patriots are really members of Isis and are trying to destroy America through Politics and undermining the American way of life! My shock came when they said they heard that too!… WTF? If the Tea Party folks had stuck to their original idealogy of fiscal responsibility and constitutional rights – then I would be right there with them. But – as we’ve all witnessed – these Tea Party folks are really just the majority of the Evangelinuts who truly believe that those constitutional rights only belong to the ‘right people’ – as evidenced by these same folks pushing through those voter I.D. laws and restricting voting rights. As for fiscal responsibility – these Tea Party folks are the same ones that rail against the bailouts for Wall Street and subsidies for corporations while allowing the Koch Brothers money to fund their damn Tea Party. How can you rail against corporations getting subsidies when your own party’s financial well-being depends on a corporation that has routinely gorged themselves at the taxpayer trough?